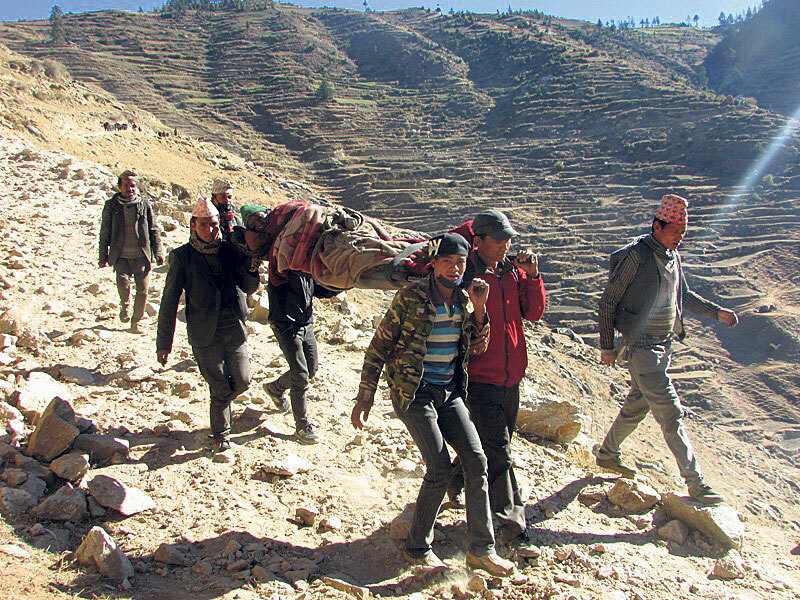 JUMLA, Nov 8: Palke Nepali, 45, an asthma patient was having difficulty to breathe on Sunday morning. Within an hour villagers rushed her to a private medical clinic on a stretcher. Medics at the clinic said that she was lucky to get medication on time and said that she would have lost her life had she been not brought there. Some hours later she was on her way back home. Though she survived that day, she now lives with a constant worry: How to afford costly health services at the private clinic? Besides the cash, Nepali was lucky that day in having villagers around who rushed her to the clinic on a stretcher. Taking an individual to the clinic on a stretcher requires sizeable number of strong villagers who can carry stretcher load as well as walk through the narrow and rough trail. “They treated me for several hours, or else, I could have died. But I feel that if such facilities were available in our health post, it would have been very convenient for me and my family members for accessing health facilities,” she said adding that in the past her family members had to return without getting treatment from the village health post and since then have never visited it. It’s not only her that has stopped from visiting the health post. She claims no one in the surrounding villages visit the state-run health facility because of continuous dejections. Continuing her experience of one-after-another dejections with the health posts, she said, “I have visited it so many times but I have hardly been able to meet a doctor (referring to Health Assistant that are usually stationed at health posts).” She claims because of such experiences, villagers have been forced to turn to private clinics, even though it is very hard for them to afford. Nepali is just an example who’s greatly frustrated by the lack of affordable and quality medical services in village. Villagers lament that they have no choice than to visit the private clinics for even minor ailments. The nearest medical for the residents of the VDC is in Raraseri. Nariman Nepali, a relative of Ms Nariman, said that even if they get lucky to receive medicines from the health posts, most of them are expired. “On one hand, we hardly meet the doctor or get any medicine. But if we do get lucky in meeting the doctor and getting the medicine, the medicine turns to be outdated,” he said adding some villagers had figured out that medicines were outdated after the medicine failed to work. “In the past some of villagers had received medicine from the health posts. After it failed to work, we found that that it was outdated. We had to visit a private pharmacy for getting fresh medicine,” Mr Nepali said. The story, however, does not end with only these allegations and grievances. 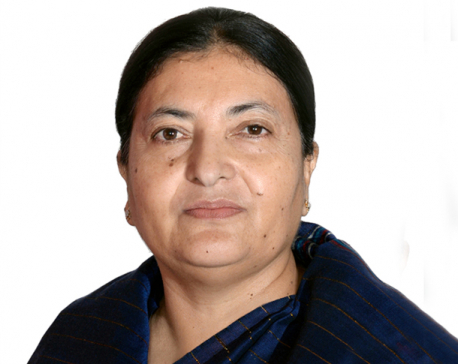 Mr Nepali adds that behavior of the officials at the health post is very demeaning. “They are mostly absent from the office. They have often handed us outdated medicine. But some of us still visit them only to be humiliated,” he said further accusing that, “They will linger around and make you wait for hours before handing out even basic medicine like the Paracetamol. Their behavior makes you feel belittled and humiliated for being poor. They simply don’t have the will to serve poor public like us.” Concluding his experience, with disgust spread all over his face, Mr Nepali claimed that villagers have lost their faith in the services provided by the government. 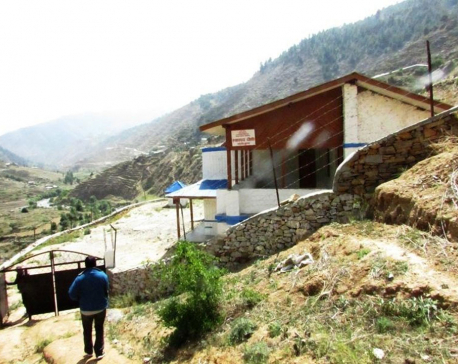 Responding to these spade of allegations and criticism, Prithivi Nath Yogi, chief at the Jumla Health Office denied shortage of medicine at any of the health posts across the district. “This year, all our health posts have enough medicines in their stores. Anyone in need of medication is being provided with instantly,” he boasted. Assessing health services even through private clinics is not easy here. There are two private medical centers in Malikathanda VDC - one in Raraseri and other in Jumlakot. Both of these clinics are not connected to roads, critical patients have to be carried on stretchers.